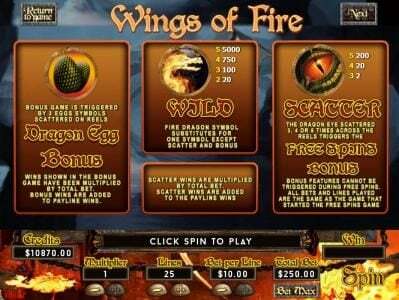 Wings of Fire is a 5 slot reel slot machine with a maximum payout of Jackpot using the dragon theme. 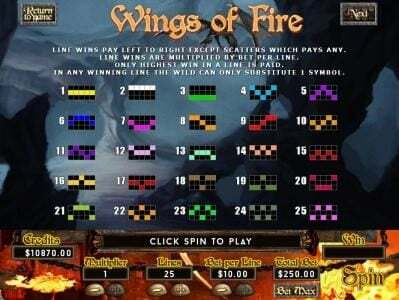 Wings of Fire Slots has not been reviewed yet, be the first to rate this slot. 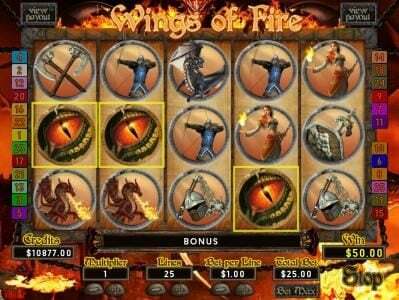 Wings of Fire is by far the most visually impressive slot available in the Soft Magic Bet platform. Players will be immersed in this 5 reel, 25 payline video slot. 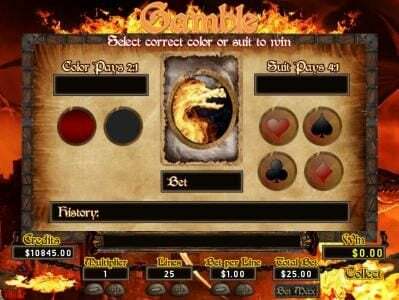 The game features included in this slot such as wilds, scatters, free spins, a Bonus round, multipliers and a gamble feature all await players. The bets that can be made on the other hand cater to every kind of online punter in the market. Regardless if the player’s budget might be high or low there will be a bet that players will be able to make. Wings of Fire takes place in a demonic world which dragons from hell roam around the reels. The numerous symbols that appear on the reels coincide with this games demonic theme & provide a more exciting experience of players. 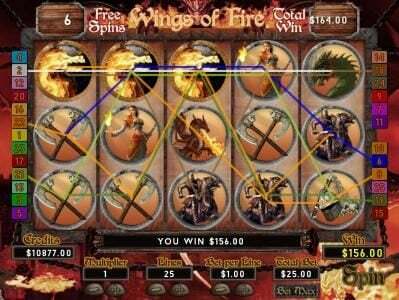 Four different dragons appear as slot symbols, one of them being completely engulfed in flames. There will also be various knights, shields, swords, axes, helmets and other symbols that appear on the reels as well. The coinciding result in an unforgettable Gambling experience. 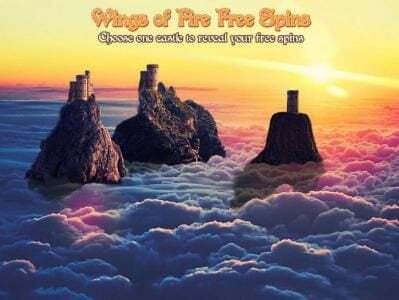 Those looking to make some of the largest bets available in the market need to look no further as Wings of Fire offers players the chance to make a maximum bet of $250.00 with each spin. This could prove to be profitable depending on which features players activate. The Wild is taken on by the form of the flaming dragon, landing on five of these symbols will allow for five thousand coins to be one. On top of that those symbols that aren’t the Dragon’s Egg or Dragon’s Eye will be removed from the reels before your eyes. In a blink new symbols will appear in the previous symbols positions to allow for new combinations to be triggered. 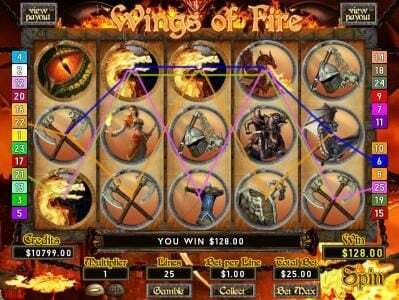 The Dragon Eye & Dragon Egg lead of the best features in this Slot. 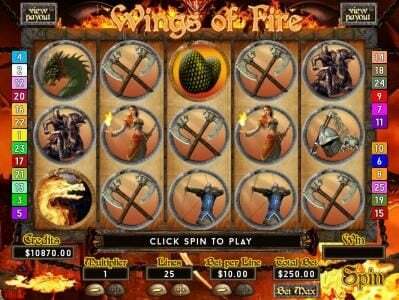 The Dragon Eye activates the free spins feature which three of these symbols appear on the reels. 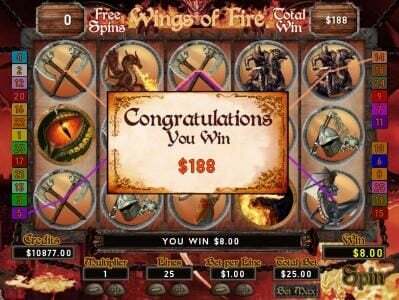 This’ll provide players with 25 Free Spins, saving them twenty five wagers in the process. The Dragon Egg on the other hand activates the bonus round which allows for a multiplier the same as the activating bet to be in play. This in return makes the maximum multiplier 250x. 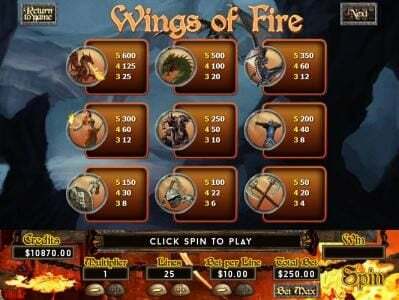 Wings of Fire takes players into an unknown world. Players will find themselves eager to explore this world, the various game features and find all of this Slots hidden treasures!